Monckton has apparently been misrepresenting himself as a member of the house of Lords. Apparently he has chosen to risk his reputation by spreading disinformation regarding the science of global warming. His opinions aside, his perspectives on the matter can best be described as naive, ignorant, or at worst fraudulent, or some combination of the three. As to his title 'Lord' Monckton admits: "I'm afraid I do exploit it quite shamelessly." At the COP 18 meeting in Doha, Qatar Christopher Monckton inappropriate sat at the Myanmar desk and spoke. Reportedly this has caused him to be de-badged for such events. Scientists have responded to Moncktons testimony given in May of 2010. The result is that Moncktons claims are scientifically unsound and unsupported by the evidence. To characterize this properly in the context of Moncktons claims, here is a list of refutations addressing various points. Monckton Assertion 1: High CO2 levels co-existed with equatorial glaciers, disproving the efficacy of warming from high CO2 levels. Monckton Assertion 2: Corals came into being during eras of high CO2, therefore high CO2 is not damaging. Monckton Assertion 3: A high CO2 concentration is beneficial. Monckton Assertion 4: If ocean acidification is occurring, it is not due to increasing CO2. Monckton Assertion 5: Global temperatures have varied due to natural causes in the past and there is nothing unusual about the recent rise. 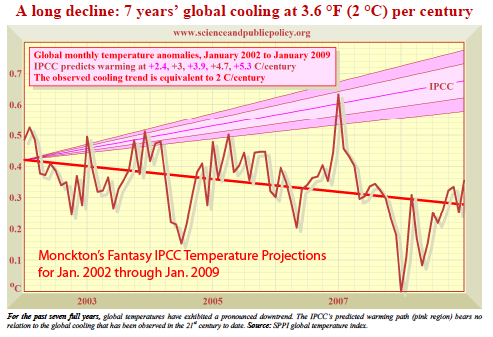 Monckton Assertion 6: The Earth is now cooling and the previous decades of warming have stopped. Monckton Assertion 7: Recent decades of warming were due to global brightening, not CO2. Monckton Assertion 8: The temperature response to radiative forcing (i.e. climate sensitivity) is very small and was over-estimated by a factor of 4 by the IPCC. Monckton Assertion 9: Climate change is a non-problem. Even if the higher estimates of climate sensitivity were correct, there is no hurry to take any action. "We have shown that this assumption is incorrect for carbon dioxide because of [its] longevity...future carbon dioxide emissions would imply further irreversible effects on the planet." - Dr. Susan Solomon et al. "In a lengthy letter to Congress some months ago, in which I addressed questions from Congressmen about my testimony before the global warming committee, I had already refuted in detail the points now belatedly raised again by the scientists who have written to Congress. The scientists were unaware of my letter to Congress because they did not have the good sense or courtesy to contact me - or even to contact the vast majority of the scientists whose conclusions I had cited - before circulating to friendly news media their prolix, turgid, repetitive, erroneous and inadequate response to my testimony. From their calculatedly furtive approach, it is legitimate to infer that their exercise was motivated more by politics than by science. One of the lead authors is currently under criminal investigation for alleged fabrication of results: another has been caught out in repeated lies: a third admits to suffering a mental disability: and many of the scientists whom these lead authors invited to contribute are among the long-discredited clique of Climategate emailers. Accordingly, it is unlikely that Congress will pay much attention to their political rant, which displays a lamentable absence of quantitative detail and a pathetic reliance on fashionable but questionable forecasting techniques that have long been compellingly contradicted by hard data. The Viscount Monckton of Brenchley"
MONCKTON resorts to ad hominem styled attacks by employing red herring diversions in what seems to be a desperate attempt to show his opinion is somehow superior to the scientific understanding, evidence, observations, physics and mathematics that support the scientific consensus that shows that humans are in fact influencing the climate and causing global warming. The overall effect is simply that Monckton is further revealing that he does not have the science on his side. So he instead attacks a few scientists with said red herring accusations to distract the reader from the reality of the his inability to comprehend the science in a relevant manner. Monckton arguments are proven false, by the evidence presented in the scientific response, and his arguments stand as unequivocally wrong in his assertions based said scientific evidence. Is Lord Christopher Monckton Committing Fraud? Using the common definition of fraud, as illustrated above, within the scope of that limitation, under definition 1 b : "an act of deceiving or misrepresenting" Monckton can be said to be committing fraud in accordance with that sub-part of the definition, however legal proof is more strenuous than mere proof in this context. That said proof is shown in the fact that he misrepresents the science to his audience. The fact that he takes money from those that pay him to present his misrepresentations draws him into definition 1 a, in part, "perversion of truth in order to induce another to part with something of value or to surrender a legal right". "perversion of truth" is shown in that he gets the science wrong. "in order to induce another to part with something of value" is shown assuming he receives some form of remuneration (monetary or gift) for his presentations and representations (lectures, radio and television appearances, unless of course he is donating 'all' of his time and effort). 5. injury to the alleged victim as a result. 5. injury to the alleged victim as a result (less easy to prove). In general his misrepresentations of the climate science, data, predictions, and projections can easily be characterized as inaccurate. In a best case scenario for Lord Monckton, his statements may simply be naive, though apparently steeped in incompetence in the subject matter. In a worse case scenario, his statements may be fraudulent fabrications. In order for Lord Monckton to prove he is not committing fraud, he essentially has to successfully demonstrate that he does not know what he is talking about. In other words, he has to prove that he is incompetent regarding the subject of climate science in relation to his public claims, assertions, and representations, when contrasted against the well established science, and the growing scientific knowledge base. I, John P. Reisman, hereby state, that I sincerely believe that Lord Christopher Monckton (hereinafter in this paragraph, he/his), if he tries very hard, may be able to successfully prove he is completely and totally incompetent in his understanding on the subject of climate science in relation to the relevant issues at hand, that of human-caused global warming, its projected impacts to society and the global economy, projected increases in temperature, projected atmospheric CO2 concentrations, and the relevant costs associated with the progression of global warming. I also must admit that I may be wrong and he may not be able to prove he is completely incompetent on the subject matter at hand and may thereby lose his case. Would Lord Monckton actually sue anyone for libel, or slander? Probably not. He would have to weigh his revenue potential (prediction?) from a lawsuit, against his current revenue sources. Since his income is apparently largely derived from misrepresenting the science it would seem that he has little, or less, incentive to go to court to prove he is incompetent in the subject of climate science and has in fact been misrepresenting the science due to his apparently complete lack of understanding of the relevant contexts pertaining to that science. In other words, would he be willing to trade a bird in the hand for some lawyers 'prediction' about what is in the bush? Heck he might get a judge that decides that Monckton's case is ridiculous and awards nothing based on the damage Monckton has already done. It's pretty amazing what a judge can learn in the process of a case. But of course there is also the possibility he would lose the case. It actually may be difficult for him to prove he is completely incompetent on the subject at hand. He has publicly called a professor "silly blogger" and ridiculed the findings of the most respected scientific institutions. So he might not be able to prove he is incompetent? Inflammatory speeches are the hallmark of Monckton's method. Whether using facts out of context or appeals to emotion, his misrepresentation of fact and his use of 'facts out of context' are clearly visible to the discerning mind. He seems to rely on the fact that his audience does not understand the complexities of climate science so he can take advantage of their disadvantage. It turns out that Monckton's main claim to fame contradicts his current position on global warming. His main claim to fame seems to be having worked for Margaret Thatcher as a policy adviser. It seems he was not very good at it though, at least not in the context of global warming. Margaret Thatcher was a very vocal proponent of moving quickly and meaningfully on the challenge of our time, that being 'human-caused global warming'. In 1989, as Prime Minister of Great Brittan, Margaret Thatcher was apparently the first world leader, to warn of the dangers of global warming. "The danger of global warming is as yet unseen, but real enough for us to make changes and sacrifices so that we do not live at the expense of future generations". "That prospect is a new factor in human affairs. It's comparable in its implications to the discovery of how to split the atom. Indeed its results could be even more far reaching." "No generation has a freehold on this earth. All we have is a life tenancy with a full repairing lease." Monckton does not seem to understand the difference between a prediction and a projection. He uses 'some' real data but often misrepresents the context resulting in a false impression. In some instances, he also seems to be mixing in some false data that is not what he claims in his presentations. He also misstates the context of the false data in relation to the real data to further confuse the reality. So, all in all, again, he quite arrogantly misstates the current understanding of climate science on a regular basis. He is making quite a bit of money going on lecture tours and doing this, which is interesting only because denialsists, including himself have said that this is what the scientists are doing. The same lies repeated over, and over, and over, and over again. In the end any and all delays will cost everyone more. The economic damage that is expected due to inaction will only grow as action is pushed further and further out. So he is making money and essentially robbing the public of their standard of living while representing himself through his assertions that he is saving everyone. There are many words that describe this sort of behavior. Some are listed above. 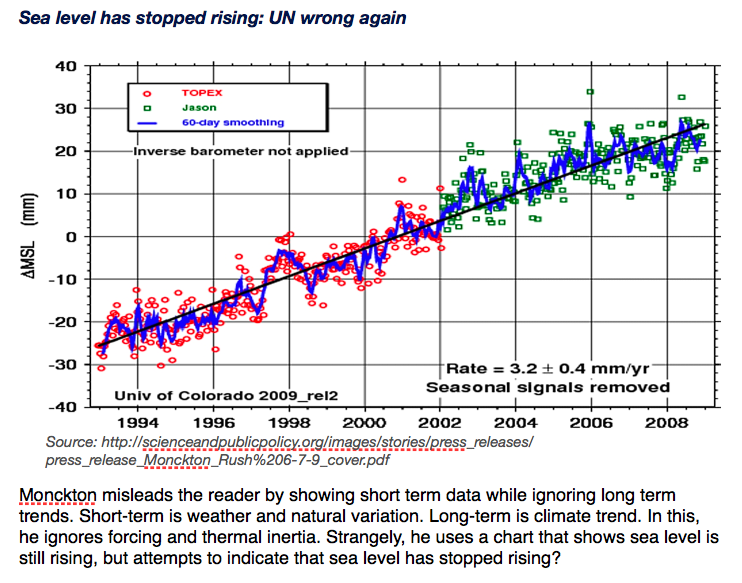 Monckton shows that the ERBE data 'proves' that global warming is essentially not happening. He quotes analysis from Richard Lindzen. The problem is that the Lindzen uses outdated data and analysis. Lindzens history is already associated with special interest lobbies and their interests, in alignment, if not direct influence. Follow the money. This, combined with the facts, when examined in relevant context, gives more than enough reason to suspect Monckton's analysis, presentation, and perspective. The House of Lords has sent a letter to Lord Monckton "stressing that he should not refer to himself as a member of the House of Lords, and nor should he use any emblem representing the portcullis." Monckton argued that the act, which debarred all but 92 of the 650 hereditary peers, removed the right to sit or vote in the upper house, but did not remove membership because peerages are granted by "letters patent" which are a personal gift of the monarch. Monckton claimed in the letter that "only a specific law can annul a grant. The 1999 act was a general law." The House of Lords said today it strongly rejects Monckton's interpretation. A spokeswoman said: "Lord Monckton is not and never has been a member of the House of Lords. The clerk of the parliaments has written to Lord Monckton, confirming that he has no association with the House and advising him to stop branding himself as such." She said Monckton's claim that the 1999 act was a general law was "misleading". "The 1999 act does not remove letters patent, it just ends the right to be a member of the House by virtue of the hereditary peerage. The Act is pretty clear and uses the term 'membership' not the 'right to sit/vote'," she added. Buckingham Palace confirmed it is "aware of this matter", but said it "can not disclose any details on private correspondence between Buckingham Palace and an individual". It did, though, guide the Guardian towards a document on its website which says misuse of the emblem is prohibited by the Trade Marks Act 1994, meaning Monckton could potentially be liable for fines and a six-month prison term if the Palace pursued the matter and successfully prosecuted him. August 7, 2010: What is he saying now? Actually not much new. But a new article on ReaClimate examining in great detail the misrepresentations that Monckton is making illustrates clearly that Monckton's claims are not based on anything but his own cherry picked data and charts that have little to do with reality when examined in proper context. One should not that It is easy to take to pieces of data, real or not and represent them as having relevance while having actually no scientific value whatsoever. This seems to be what Lord Monckton excels at. Article source extracted from RealClimate article by Barry R. Bickmore, Brigham Young University: Monckton Makes It Up. Summarized by John P. Reisman. Let's examine some of Monckton's graphs. His continual misrepresentation of data and distortion of context continues to confuse people. 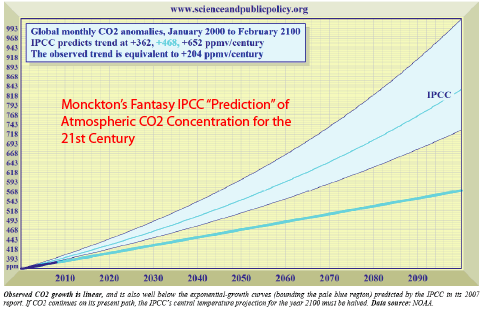 In the next two graphs Monckton claims that the light blue area represents the IPCC 'Predictions' for CO2 but in reality the IPCC does not make predictions, they show projections for various scenarios. Monckton 'cherry picks' the picture he likes and then misrepresents the data and context in his presentations. If it sounds confusing, that's because it is. He is confusing not only the data but those to whom he presents 'his' perspective. In other words he's confusing the science and the people he talks to. Fantasy #1. Lord Monckton claims the light blue areas on his graphs (Figs. 1 & 2 below) represent the IPCC’s 'predictions' of atmospheric CO2 concentrations. Reality #1. The IPCC reports don’t make predictions of future atmospheric CO2 concentrations. They do show projected scenarios under various circumstances. In the graph he identifies observed CO2 concentrations as anomalies which is incorrect. They are measured observations. One is left to guess as to why he represents 'measurements' as anomalies. Incorrectly identifies CO2 measurements as anomalies. Incorrectly 'predicts' that CO2 rise will be linear. Incorrectly 'predicts' that there is no natural CO2 feedback mechanism. Incorrectly ignores projected increases in multiple scenarios as illustrated by the IPCC. 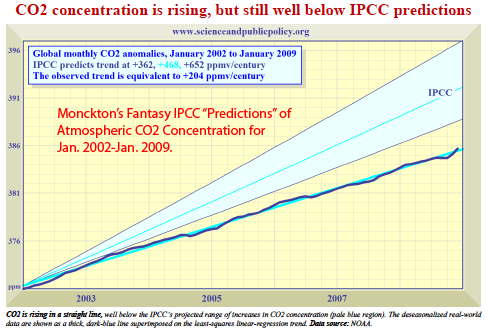 Note: Monckton accuses the IPCC of predicting when they are projecting and here he commits the same sin by predicting CO2 rise, rather than projecting. Incorrectly uses too short a time scale of CO2 measurements. 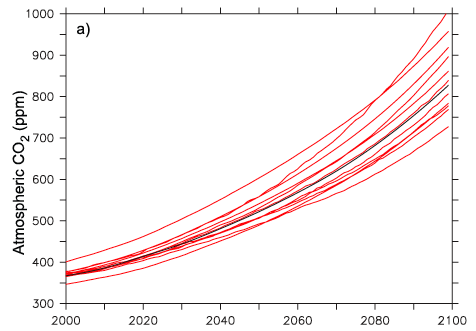 Incorrectly cherry-picked a long-term emission scenario (A2) and contrasted it to the short-term cherry-picked data. Note: Monckton accuses the IPCC of 'predicting' when they are 'projecting' and here he commits the same sin by predicting CO2 rise, rather than projecting. 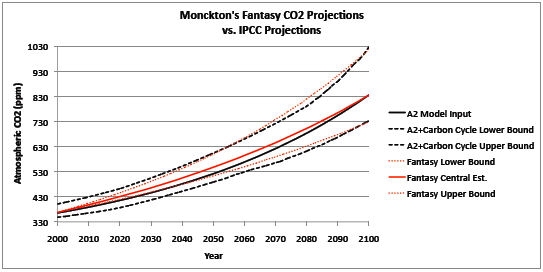 In the figure below you can see the IPCC results in black from the A2 scenario and Monckton's results in red. He clearly is not showing the IPCC results so his claims that he is showing the IPCC 'predictions', which are actually only projections, is false, and is further confused by his dishonest representation of the material and contexts. 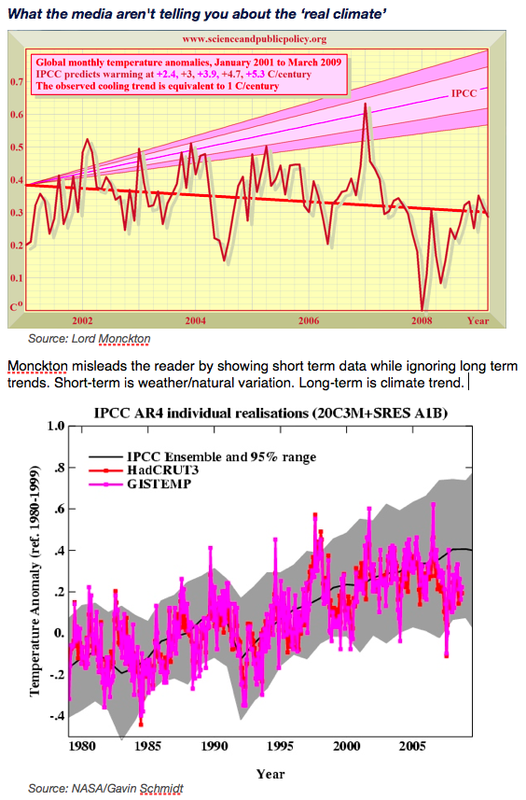 Monckton has apprently 'not' used the IPCC Model inputs while claiming that he did. Figure 5. This is a blow-up of the graph in Fig. 4 for the years 2000-2010. Bickmore added the annual global mean atmospheric CO2 concentrations (blue line), obtained from NOAA. Monckton incorrectly used too short a data representation of CO2 in contrast to his claims of future atmospheric CO2 concentrations. 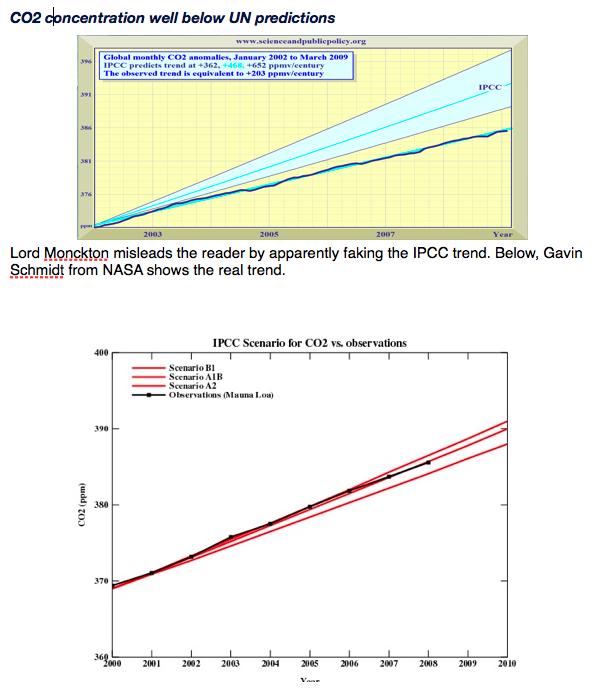 Monckton has clearly misrepresented what he calls the 'Central Estimate' of the IPCC report. Monckton has clearly misrepresented the outer bounds of the A2 model. Overall, Monckton's representation misrepresents the scientific understanding. Reality #2. Monckton has chosen to short a time period of measurement and does not include climate feedback mechanisms. Climate is not a linear process, it is non linear. It is a gross oversimplification to say climate works in a straight line as Monckton infers. It is impossible to distinguish a linear trend from an exponential trend like the one used for the A2 model input over such a short time period. Monckton again cherry picks his data and represents it out of context. In figure 6 below he attempts to mislead his audience by showing a short time period (natural variation) in contrast with a 'cherry picked' projection (see above re prediction vs. potential projection). Note: Monckton's claim that "The observed cooling trend is equivalent to 2C/century" is extraordinary. The natural cycle and orbital forcings indicate that without anthropogenic forcing we 'might' begin to enter the next ice age in 20,000 years. To claim and/or infer that we will enter an ice age based on his cherry-picked short-term data (natural variation) is truly amazing. Further Note: Monckton is his typical cherry picking fashion has moved his goal posts again to his advantage. If you scroll down this page you will see a similar graph to the one above. But the start point of the IPCC ramp has moved and he moved the beginning of the temp from the beginning of 2002 toward the end of 2002. He also changed his prediction of "The observed cooling trend" form 1C per century to 2C per century. That is 'Moncktonized Science'. you simply cherry pick the data that most favors your own desired outcome. What he should do if he really wants to show some cooling is limit his cherry pick to 2007. That way, according to his data, he can show that the earth will cool 60º C/century. As Lord Monckton has said: "Now, if we’re going to exaggerate, let’s exaggerate properly." Incorrectly uses short-term natural variation to attempt to falsify a long-term climate trend. Fails to identify his data source for temperature. Incorrectly identifies monthly temperature measurements as anomalies. Incorrectly predicts that we will enter in an ice age within 200 years. REALITY #3. 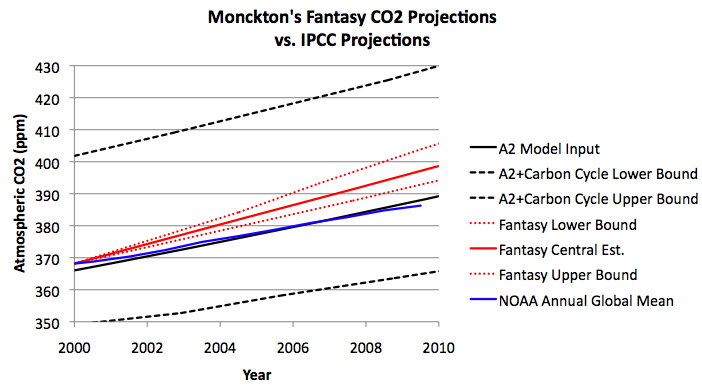 Monckton didn’t actually get his Fantasy IPCC predictions of temperature evolution from AOGCM runs. Instead, he inappropriately fed his Fantasy IPCC predictions of CO2 concentration into equations meant to describe the EQUILIBRIUM model response to different CO2 concentrations. This, of course, is also another great example of how Monckton uses facts out of context. By comparing his short-term cherry-picked temperature graph against the model for equilibrium response he is actually illustrating the difference between long-term response and short-term natural variation. This is not scientifically interesting because it is an irrelevant contrast. He uses this to misrepresent the science but it is scientifically dishonest as a representation. Simply put he is using facts our of context. Apparently, according to Monckton, he admits using these facts out of context and apparently thinks that is an appropriate use of the data? Let us be reminded, his education was in journalism, not science. He may be good with word crafting, but he certainly does not understand climate science. These errors compound into a rather stunning display of complete incompetence. But since all, or at least nearly all, of this has been pointed out to Monckton in the past, there’s just no scientifically valid excuse for this. He’s just making it up." He paints himself kindly and scientific in the debate of course, and as he clearly stated his title in his post to make sure everyone knows that he is Lord. "Monckton of Brenchley (a Lord, whether you like it or not)"
Monckton: Tone it down, Gavin. Go through your blog and remove every yah-boo you have perpetrated, and see how much more authoritative it will begin to look. At present, the difference between us is this. You are taken seriously only by climate-extremists who share your own narrow and politicized viewpoint. Those of us who have none of your financial or political interests in this question and are merely trying to find out whether and to what extent there really is a “climate crisis” are taken seriously by everyone except the climate extremists, who are increasingly ignored precisely because they will not engage in calm, rational, and above all scientific argument. It’s your call. So Monckton, in RealClimate, says Gavin should tone it down or people won't take him seriously? But in his speech that he delivered at Heartland Institute he did not seem to follow his own advice? Lord Christopher Monckton, Third Viscount Monckton of Brenchley, delivered the closing keynote address at the 2009 International Conference on Climate Change, praising those in attendance for holding fast to their scientific ethics and speaking truth to power. Where are they all today, those bed-wetting moaning Minnies of the Apocalyptic Traffic-Light Tendency--those Greens too yellow to admit they’re really Reds? The main message of this conference to the bed-wetters is this. Stop telling lies. You are fooling fewer and fewer of us. However many lies are uttered, the scientific truth remains unalterable. The Forces of Darkness, with their “global warming” chimera, came perilously close to ending the Age of Enlightenment and Reason. They almost ushered in a new Dark Age. Yet they have failed. Why? They have failed because you, here, have had the courage to face them down, to confront their falsehoods, and to nail their lies. The Age of Light and Reason shall not die. Dylan Thomas wrote, “Do not go gentle to that last goodnight: Rage, rage against the dying of the light.” You have not raged in vain. The world is not cooking: It is cooling. Every opinion poll--even those conducted by the bed-wetters themselves--shows that global public opinion is cooling as fast as the global climate. In one recent survey, “global warming” came at the very bottom of a list of political and environmental concerns, immediately behind the need to clean up dog-poop on the streets. Why? Because dog-poop is a real environmental problem. “Global warming” is not. The correct policy response to the non-problem of climate change is to have the courage to do nothing. When Hansen’s political ally and financial beneficiary Al Gore had only predicted one-twelfth that amount of imminent sea-level rise, Mr. Justice Burton said in the London High Court, “The Armageddon scenario that he depicts is not based on any scientific view.” But then, Al Gore knew that all along. In 2005, the year he said sea level would imminently rise by 20 feet, he bought a $4 million condo in the St. Regis tower, San Francisco--just feet from the ocean at Fisherman’s Wharf. The only danger to sea level is from all those bed-wetters. Now, if we’re going to exaggerate, let’s exaggerate properly. Sea level is going to rise not by Gore’s 20 feet, not by Hansen’s 246 feet, but by 2,640 feet. Half a mile. You heard it here first. There goes Andy Revkin of The New York Times, dashing to the telephone to tell them to hold the front page. Dr. Strangelove has published a peer-reviewed paper--so it must be true--saying 60 percent of all species will soon be flung into extinction. It won’t be 60 percent. It will be 326 percent. Whaddaya mean, we can’t extinguish more than 100 percent? You heard the U.S. President. Yes We Can. How do we know we can? Because the IPCC says. “Because the IPCC says.” That pathetic phrase is nothing less than an instrument of political abdication on the part of our democratically elected leaders. There was once an androgynous crooner who called himself “The Artist Formerly Known As Prince.” In Britain, Her Majesty’s Opposition, “The Party Formerly Known As Conservative,” has stated, in the person of its chief of policy: “We cannot question what the scientists say.” Yes we can. When the Founding Fathers of this great nation met in that hot summer long ago in the City of Brotherly Love to craft the noble Constitution of the United States, they were building their great nation upon the solid foundation of your Declaration of Independence. Independence! This winter, if the United States signs up to the Treaty of Copenhagen, her independence--and our freedom--will be gone forever. If Thomas Jefferson were alive today, he would be turning in his grave. Last year the President of the Czech Republic told this Conference, “It’s not about climatology--it’s about freedom.” This year the President of the European Union told us the same. Two statesmen with one message. Let me ask you this question--and it is not a rhetorical question, I want to hear your answer loud and clear. Do we want to be governed not by representatives whom we elect and hold to account, but by the technocratic-centralist wannabe-world-government of the IPCC? Do we want to pay a single red cent more of our taxes to fund the “global warming” boondoggle? Are we terrified by the spectre of sea level rising 246 feet? Do we expect sea level to rise this century by more than about 1 foot? Do we want to see the bed-wetting liars, hucksters, shysters, fraudsters, and racketeers ever-more-extravagantly rewarded with honors and prizes for their ever-more-extravagant falsehoods, fables, and fictions? Do we need carbon taxes? Do we want to let Joe Bast get away with not organizing another Heartland Conference next year? You, in this room, have bravely upheld the truth and the scientific method against all manner of lies, threats, sanctions, personal attacks, and entertaining revisions to your CreepyMedia biographies. Because you have not failed or faltered, the Forces of Darkness are now scuttling back into their lairs, there to snivel in the eternal darkness of utter oblivion and CNN. Divine Providence, unlike the bed-wetters, has a sense of humour. Governor Schwarzenegger--now, there’s an oxymoron for you, or “moron” for short. As soon as Governor Schwarzenegger announced that the science was settled--and how the hell would he know?--two-thirds of California’s citrus crop was destroyed. Were all those oranges and lemons wiped out by drought? Or by forest fires? No, by an exceptionally bitter frost. Last summer, just as the President of the Royal Society, the world’s oldest taxpayer-funded pressure-group, was telling us, “Global warming is happening now,” global temperatures had already been plunging for nearly seven years, at a rate equivalent to almost 4 Fahrenheit degrees per century. Has your favourite news medium reported that? Probably not. Maybe that’s why the President of the Royal Society didn’t know. He doesn’t get his science from the learned journals. He gets it from the media. Just as Tony Bliar was announcing on his blog that “global warming is getting worse,” just as Al Gore was testifying before the Senate--during an ice-storm--that we face a “climate crisis,” global temperatures plummeted still more. They have been plummeting at a rate equivalent to 11 Fahrenheit degrees per century throughout the four years since Gore launched his mawkish, sci-fi comedy horror B-movie. At this rate, by mid-century we shall roasting in a new Ice Age. Gore no longer dares to publish his supposed “evidence” for “climate crisis,” because he is rightly terrified that we here will pounce on it at once and demonstrate that it is materially, serially, seriously inaccurate--demonstrate its falsity by the dull, outmoded method of reference to the facts, the science, and the data. Why are those slides “not available at this time”? Because Gore is running scared. Rightly scared. Scared of prosecution for peddling a false prospectus in Generation Investment Management. Neither Gore nor any bed-wetter will any longer dare to debate the science of climate with us or anyone in the light of day. Gore’s speaking contract stipulates that he will not debate, he will not answer unscripted questions, and he will not be interviewed except by journalists acceptable to him. Which journalists are they? The dim ones that don’t know any science, and the prejudiced ones that don’t care. Just about all of them. Recently four of us in this room were invited to a meeting of Government and opposition leaders and policymakers in Madrid, to debate the science and economics of climate against Al Gore (not a climate scientist); Railroad Engineer Pachauri, the head of the U.N.’s climate science working group (not a climate scientist); Sir Nicholas Stern, the author of the U.K. Socialist Government’s joke report on the economics of climate change (not a climate scientist); and the Environment Minister of Spain (not a climate scientist). All four of us--three climate scientists and I (not a climate scientist) accepted the invitation to debate. All four of them refused. They said they would only come if they could speak on their own, without facing any challenge, any debate, any question, any fact, any inconvenient truth. Not one of them dared to face us. They did not have what in English we should call the cojones. There was no climate crisis. There is no climate crisis. There will be no climate crisis. “Global warming” is not a global crisis. It is a global scientific fraud. Without you, that blunt truth might have taken far longer to emerge than it has. And delay is fatal. Though lies cannot alter or harm the truth, they can kill our fellow men. The environmental movement is out of control. It is now humankind’s deadliest enemy. In the name of humanity, it must be outlawed. Thirty years ago, the soi-disant “Greens” agitated for DDT to be banned. They killed 40 million people of malaria, most of them children. Eventually, after a third of a century, the WHO at last caved in to humanitarian pressure from me and others and reversed the ban. Dr. Arata Kochi, announcing the end of that murderous ban, said, “Usually in this field politics comes first and science second. Now we must take a stand on the science and the data.” That is what you in this room have so gallantly done. You have taken a stand on the science and the data. Now the very same soi-disant “Greens” are killing millions by starvation in a dozen of the world’s poorest regions. Their biofuel scam, a nasty by-product of their shoddy, senseless, failed, falsified, fraudulent “global warming” bugaboo, has turned millions of acres of agricultural land from growing food for humans to growing fuel for automobiles. If we let them, they will carelessly kill tens of millions more by pursuing Osamabamarama’s stated ambition of shutting down nine-tenths of the economies of the West and flinging us back to the Stone Age without even the right to light fires in our caves. The prosperity of the West is not only our sustenance. It is also the very lifeblood of the struggling nations of the Third World. If our economies fail, we are inconvenienced, but they die. In the past year there have been food riots in a dozen major regions, in protest at the doubling of the price of staple food which the World Bank blames almost entirely on the biofuel scam. Has your favourite news medium reported the riots and the mass starvation? Probably not. Has it given our starving fellow-men--our brothers and sisters--the same attention and prominence and column inches and frequency of coverage as it has given to every icicle putatively dribbling in Greenland? Certainly not. Those who are dying are only black people, poor people, in far-away countries of which we know little, with no voice and no vote. Why should we care? Well, we should care. And we--you and I--we do care. In this debate it is we who hold the moral high ground. There is no incompatibility between science and religion, as long as religion does not attempt to usurp the realm of science, and as long as science does not become a religion. So I hope that this scientific conference will forgive a Christian if, in a Christian country founded by Christians, he does his duty as the valedictorian by sending you away from this great gathering with a blessing--a blessing that has been spoken in the stone-built village churches of England for longer than anyone can remember. Let it be a tribute to your steadfast courage. Lord Christopher Monckton, Third Viscount Monckton of Brenchley, is chief policy advisor to the Science and Public Policy Institute. He has held positions with the British press and in government, as a press officer at the Conservative Central Office and as Prime Minister Margaret Thatcher’s policy advisor. Monckton advised Thatcher on technical issues such as warship hydrodynamics, psephological modeling; embryological research, hydrogeology, public-service investment analysis, public welfare modeling, and epidemiological analysis. He currently is a consultant giving technical advice to corporations and governments. He has been active in the debate over global warming, publishing articles critical of prevailing climate change opinions and chastising U.S. Senators John Rockefeller and Olympia Snowe when they wrote a letter to the chief executive officer of ExxonMobil asking him to stop funding scientists who reject global warming, In February 2007, he published an analysis and summary of the Intergovernmental Panel on Climate Changes’s Fourth Assessment Report. Lord Monckton has found another way to "shamelessly" take advantage of his inherited title by thrusting himself into the position of being a 'defender of American democracy'. He relies on building straw man arguments while he appeals to the emotions of the American people. World Government; Communism, Global Climate Treaty; Transfer or Redistribution of Wealth; Climate Debt; CO2 less than 1/6 than IPCC estimates (Lindzen). He claims President Obama said during his election campaign that the US Constitution is only a piece of paper (one might think that that would have come up during the election campaign though?). Actually this sounds like a rehash of the rumor that President Bush said the constitution was 'just a piece of paper' in 2005. Monckton has merely replaced the name Bush with Obama. The degree of chicanery in Moncktons remarks remains high. "What they're now going to do is to set up a world government and the word government actually appears in the treaty. But, you heard it hear first, the word election, democracy, vote, or ballot, does not appear anywhere in the 200 pages of the treaty. It's going to be a dictatorship." "What we are talking about is a fledgling world government and because it's not elected, it's essentially a communist world government." A veritable litany of error and contextual misrepresentation (see spin here & here). First the document he is referring to is a 'draft document'. It is trying to set up governance (administration) for the treaty (and yes, governments will need to be involved in the treaty). Without governance, how can the treaty be enforced (without enforcement, why make a treaty)? Second, it is unlikely it will be signed this year anyway, based on all that we are hearing about how things are going with COP15. Monckton is making the rounds on CNN, Glenn Beck, etc. He has figured out how to get the spotlight to shine on himself and will hold on to that as long as he can. Simply put, Monckton, and others that are delaying action, are making money and gaining fame, at the expense of everyone on the planet. He claims recent evidence proves sensitivity is lower than estimated. This of course based on the work of Richard Lindzen. Apparently, Lindzen is connected through a string of associations with lobbyists that exist to protect fossil fuel industry profits. We, the people, need to be aware of what it really costs if we do nothing. According to work done at MIT, combined with the Center for Strategic Analysis, the cost is hard to even fathom. A global treaty is needed to begin to address global warming in a meaningful manner. The majority of studies indicates that climate may be more sensitive that models are prediction. Without a treaty, democracy itself will ultimately fail. History has shown repeatedly, that when resources get scarce, democracy suffers. If the goal is to protect democracy, then we need to rapidly address global warming mitigation and adaptation issues. Monckton thinks short-term, in the sense that if he were not inflammatory on the issue, he would not be making money talking about it, and he would not get to appear on national television. We, the people will need to be less emotional about the issue and more realistic. Increased CO2 and other greenhouse gases from industrial sources are affecting the climate. Inaction will ultimately destroy the world economy. How fast? It begins now. ...in just 25 years the glaciers in the Himalayas, which provide water for 3/4 of a billion people could disappear entirely. IPCC estimates tell us now, that by 2080, an extra 1.8 billion people, equal to a quarter of the worlds current population, could be living and dying without enough water. To not address climate debt is to support the notion that Democracies do not support justice or fairness, which is the foundation, or basis, for democracy itself. America itself was founded on certain principles including justice, liberty, fairness. If we abandon the founding principles of fairness, freedom and justice, on what basis can one claim to be American, or a lover of democracy and freedom, on what principle? Or are we to abandon these principles? America, and the western world, has emitted or been responsible for the emission of the majority of greenhouse gas emissions. Those that will suffer first, and most, in the beginning, live in countries that have only emitted 8% or less of global emissions. On what basis can those responsible for the largest amount of emissions claim no responsibility for the result of that emission? Responsibly addressing climate debt is important and at the same time, in doing so it is important to ensure that we are addressing all issues simultaneously. Economic viability of the overall system and that we do not allow such 'payment' to add to the problem of global warming but rather that all solutions bring us closer to mitigating the cause, that of human caused global warming. This in no way is to say that we can or should shirk responsibility, but that we must quickly address needed solutions as well as the justice issues that present themselves in the world we have now created. Monckton is playing to the crowd and he has an audience. He is taking it a bit far though. When his spin of the message goes so far out into unsupportable claims, eventually, his words will be ignored. In the mean time, he knows he has found a spotlight that he can make sure shines on him, so it is doubtful he will let that go easily. He remains inconsiderate of the larger issues, that of responsibility, accountability and moving toward meaningful mitigation and adaptation. His June, 2009 foray into the debate, addressing a question from Rush Limbaugh, can be found here: on the Science and Public Policy web site (http://scienceandpublicpolicy.org). For the sake of news integrity and redundancy in the event the link is moved or deleted we provide a copy of the linked document here. As an example of the degree of errors in Lord Moncktons work and analyzed his paper 'Monckton_Reply_to_Rush_on_Chu.pdf' and written a rebuttal. What Monckton says: "What the media aren't telling you about the real climate"
Note: Moncktons chart is actually stretched horizontally in order to give the impression that the trend he is referring to is visually more flat. It is of course an illusory technique. To think that Lord Monckton is anything close to scientific in his representations is reasonably considered an absurd assumption. When one applies Lord Monckton's methodology to the chart, one can see that sea level rise has stopped many times during it's rise. Again, short term variability is weather, long term trend is climate. Monckton's representations are clearly deceptive. 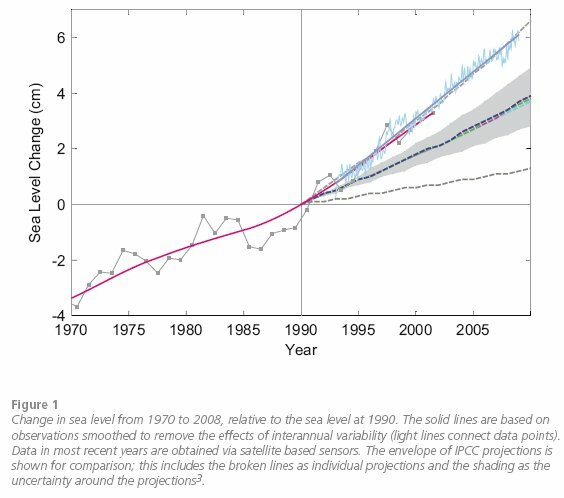 Not only is sea level continuing to rise, it is beyond the upper bounds of the IPCC estimate, which as pointed out in the January, 2009 Sea Level Rise report, is in line with expected estimates of faster SLR. These indicators are important to pay attention to. 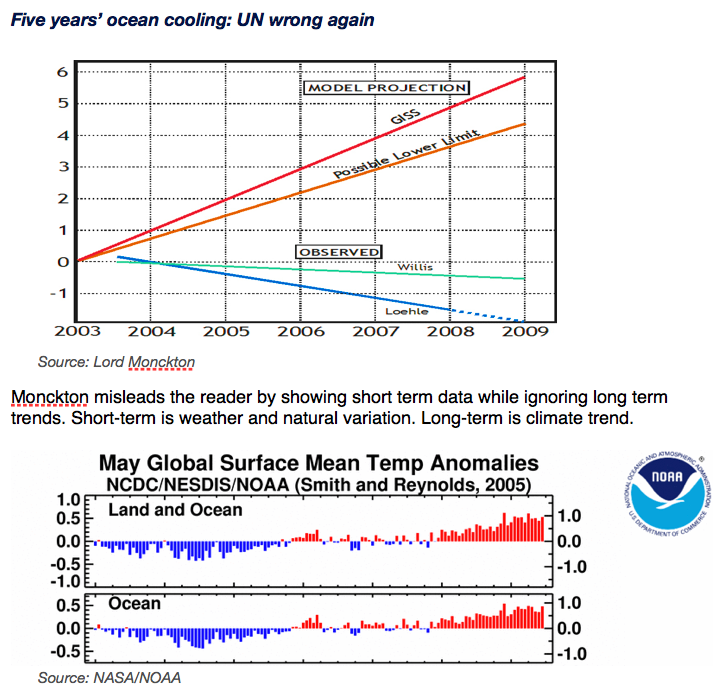 What Monckton says: "Five years' ocean cooling: UN wrong again"
What Monckton says: "Arctic sea-ice extent: an 8 year record high"
Monckton again gets it all wrong. He uses the IARC-JAXA chart which shows an overlay of multiple years of ice extent growth and recession. He does not show the actual ice extent trend. One might suspect that he did ont want to show the actual ice extent trend as it did not support his apparent thesis. 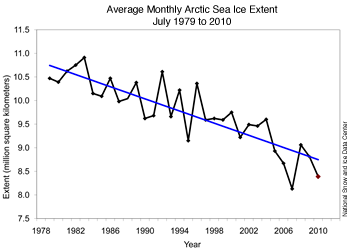 The below ice extent chart shows the ice extent trend as understood by the science. You can judge for yourself it there is an 8 year record high? Figure 3. 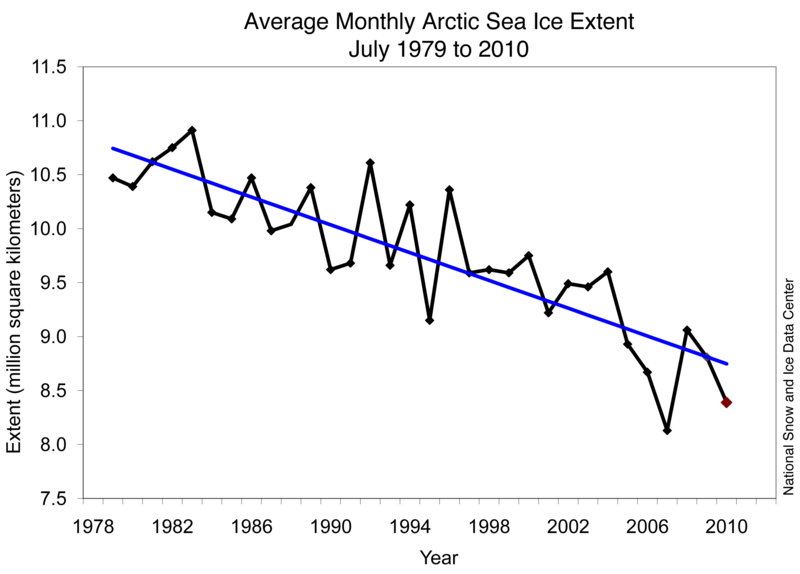 Monthly July ice extent for 1979 to 2010 shows a decline of 6.4% per decade. 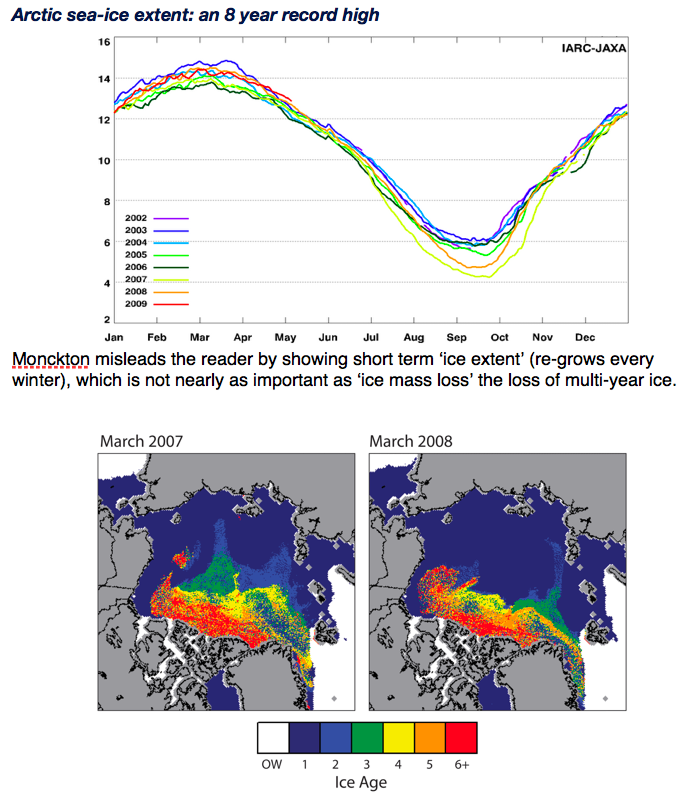 What Monckton Says: "Global sea-ice extent: a regular heartbeat." Facts out of context and just another straw man argument. Monckton shows global sea ice extent (north/south pole combined), which seems stable. Again ice extent is not as relevant as ice mass. This graph actually has no relevance to the point of the argument. We already know that ice extent is diminishing in the Arctic, and increasing in Antarctica, so they 'seem' to cancel each other out. But in reality, the two separate ice extent measurements help confirm global warming. This is not evident in a combined graph. This is another great example of using facts out of context. Monckton is relying on the visual image which might trick people into thinking he is right. Perspective: Warming oceans add moisture to the atmosphere and that is, and was, expected to increase ice extent in Antarctica with increased snow due to increased water evaporation due to warmer oceans. Antarctic ice calving has increased and is now said to be contributing about half of the sea level rise in relation to the Greenland ice calving rate. Generally speaking as of 2009, sea level rise is attributed 25% to Greenland, 25% to Antarctica, and 50% to oceanic thermal expansion (ocean warming). Note: Antarctica sea ice extent growth observations are literally based on thin ice. As the overall ocean heat content rises the Antarctic sea ice extent will eventually reverse. 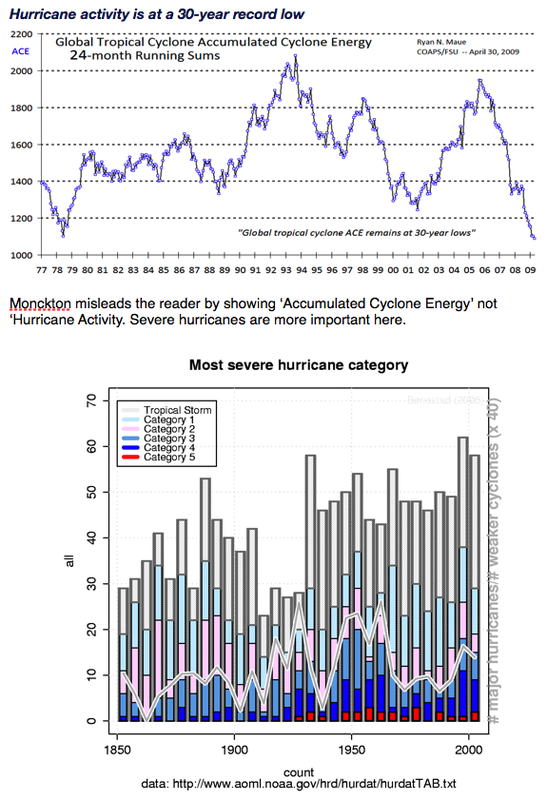 What Monckton says: "Hurricane activity is at a 30-year record low"
What Monckton says: "CO2 concentration well below UN predictions"
2010/08/07 - RealClimate: Monckton makes it up. 2009/10/14 - Prof. John Abraham response to Chris Moncktons presentation at Bethel Univ. 2009/01 - Monckton’s Artful Graph. 2008/07 - APS: Monckton's failed attempt to understand the complexities of climate (NOT PEER REVIEWED). 2008/07: How APS was infiltrated by deniers.